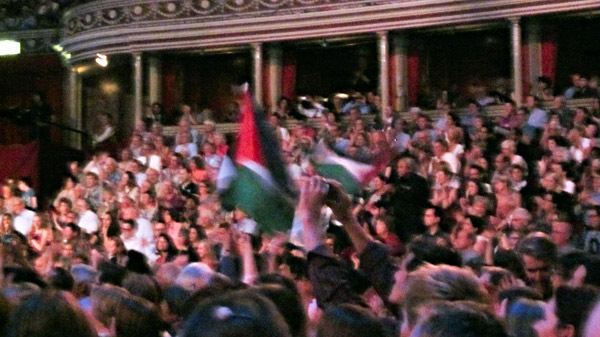 On August 8, seventeen young Palestinian musicians put Palestine on the ‘map’ of one of the world’s most prestigious international music festivals, the BBC Proms. Aged twelve to twenty-three years, they are members of the Palestinian Strings, a brainchild of the Edward Said National Conservatory of Music, Palestine’s preeminent music institution.Their appearance at the Proms was a collaboration with the renowned violinist Nigel Kennedy and several members of his Orchestra of Life. Kennedy, well-known for his musical interests beyond the confines of standard Western practice, first learned of the Palestinian musicians from a Youtube video. The entire concert was based around Antonio Vivaldi’s ‘Four Seasons’. The works’ programmatic character, combined with the improvisatory tradition of eighteenth century Italy, allowed Kennedy the wide artistic freedom that is his hallmark, and the combined ensemble widened this far beyond anything ever anticipated by the ‘red monk’ of Venice. Mr. Kennedy is the most high-profile classical artist to date to boycott Israel because of its expropriation and ethnic cleansing of Palestine. At last Thursday night’s concert he did something even more courageous: On the stage of London’s Royal Albert Hall, to a capacity audience of about five and a half thousand people, plus as many as two million listening live on BBC Radio 3, he invoked the taboo ‘A’ word—Apartheid—to describe the world where his young on-stage colleagues live. Nor did the BBC, at writing, excise the comment from its week-long online audio of the concert, and the recorded concert will be broadcast on BBC television to a viewership in the millions. A petulant voice behind me asked, ‘Why do we have to bring politics into this?’, another barked ‘Right, let’s leave now’. I’m glad its owner was persuaded by his children to stay because I cannot imagine he could have remained untouched by the encore, a performance of the slow movement of Vivaldi’s A minor Double Concerto by Kennedy and 15-year-old Palestinian violinist Mostafa Saad, whose eloquence cast a spell on the hall. Watching the students playing around backstage, before performing with utter professionalism before their 6,000-strong audience, it is hard to imagine the difficulties they face when rehearsing in Palestine, and impossible to disentangle the ensemble’s existence from the politics surrounding it. Kennedy is the protégé of the late Yehudi Menuhin, whose father, the intellectual Moshe Menuhin, was among the most articulate of early anti-Zionists. Moshe’s Decadence of Judaism in Our Time is a meticulously documented exposé of Zionism, written from first-hand experience. When in 1897 the first Zionist Congress met in Basel, the BBC Proms concert series was already in its third season. Today, as the United States fuels the ‘peace process’ to further extend Israel’s sixty-five year lease on impunity, the Palestine Strings have not only made a refreshing artistic contribution, but their very presence on this high-profile London stage has reminded Britain that they still live and die under the catastrophe it set in motion nearly a century ago. 1. Michael Church, Prom 34 – Kennedy, Palestine Strings, Orchestra of Life, The Independent, August 9, 2013. 2. Kennedy stated this on-the-record as early as 2007. See e.g., Noam Ben Zeev, Punk rebel with a classical cause, Haaretz, July 24, 2007. 3. According to the BBC, the Proms are heard on the radio by as many as two million people, on television by as many as fifteen million. 4. Helen Wallace, Proms Diary: Nigel Kennedy and the Orchestra of Life, in classical-music.com, the official website of BBC Music Magazine, August 9, 2013. 6. Yehudi Menuhin’s father, Moshe Menuhin, attended the nationalistic Hebrew Gymnasia Herzlia in Jaffa as a youth, and lived through the rise of Zionism and the establishment of the Israeli state. There are two editions of his Decadence of Judaism in Our Time: the first was in 1965, published by Exposition Press; the second, which includes a new section on the 1967 war, was published in 1969 by The Institute for Palestine Studies.